If up to now your ideas of a holiday have been restricted to terra firma, either physically or in imagination, -it is time you find out how True Love Dreamboat can change your view She is both a magnificent sailboat bringing you back to Mother Nature with salty waves, sun and fresh winds,andamodern-mindedstylishcozyrefuge,takingdreamersawayfromthemundane. A vessel with most interesting history, she owes her origins to a rather remarkable class of warship: Kriegsfischkutter. At war times, such boats could carry depth charges, 37mm cannon, 20mm machine gun and mine sweeping gear according to their roles as minesweepers, patrol boats or submarine hunters - and a crew of up to 20. Later she was fully renovated and redesigned by her previous owner NormanCook(aka DJFatboySlim)andhisteamofboat-lovingfriends,andgivenanameofBarracuda. “We called it a refit but actually (the boat) had to be rebuilt”, said the DJ. “We didn’t want a Gin Palace super yacht—we wanted it funky.” That meant a mixture of teak, mahogany, pine and beech instead of gold or marble, resulting in lots of color combined with soft furnishings and hand-picked retro trinkets. Because Norman and his wife, British TV presenter Zoe Ball, are tall, they sidestepped pokiness with roomy bunks and uncramped bathrooms. A decent hull width enabled extra luxuries such as proper porcelain loos en suites, bunks not far off regular beds, modern conveniences such as round-the-clock hot water, a washing machine anddishwasher. After having passed from the loving care of Fatboy Slim to her present owner elite global fine arts operator House of the Nobleman, Barracuda embraced her new identity as True Love, and was thoroughlyrenovated,reequippedandmodernizedagaininthebeginningof2018. She is an amazing vessel — soundly constructed and safe with a particular style and comprehensively equippedshemakesawonderfulsecondhomeinthesun.Shecould equallybecharteredforwhichshe is MCA coded cat 2. A further spectacular option could be as mother ship to a racing yacht short on crew accommodation. All in all she has lots of flexibility also with her massive on deck areas for entertaining.Downbelowsheistastefullyfinishedwithsuperbcraftsmanshiptomake averystylishand comfortable yacht. The vessel isperfectly outfittedforhip-hoteldevotees as much asdedicated sailors, and currently anchored off the Island of Ibiza. Once again Britannia rules the waves with this luxury yachtavailableforcharter. 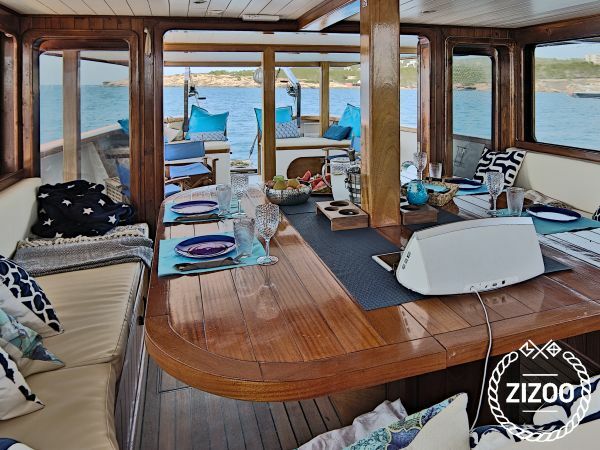 Ofcourse, youdon’tneedtobeanexperiencedsailortoenjoythiskindofhighlifeontheseas—there’s a super sharp crew to navigate guests through the sparkling waters off the White Isle. Not just a pretty boat, a night on the True Love also includes a live-in chef to ensure non-stop gourmet on the go. The boat comes equipped with fishing rods, masks, snorkels and fins, water ski and wakeboard, plus speedboat lessons are available from the crew and seafood cuisine master classes from the on-board chef.There’sevenadress-upboxofpiratecostumesfortheenthusiastic.